We spent the second week of our summer family trip by the beach on the island of Koh Samui in the Gulf of Thailand. We travelled there by road and ferry from Elephant Hills tented camp on the Thai mainland, having started off with a few days in the capital, Bangkok. Our home for the week was The Tongsai Bay, a delightful and luxurious resort in a secluded private cove in the northeast of the island. We arrived at The Tongsai Bay in the dark, and my first impression was of a peaceful, welcoming place with kind, friendly staff. A porter took our bags while a receptionist led us to some comfortable sofas in the low-lit lobby. While she checked us in, we were served cool, refreshing drinks which tasted of ginger and mint, and I felt myself start to relax after our journey. The family-owned and run Tongsai Bay was the first five-star luxury hotel in Koh Samui when it opened in 1987. Founder Khun Akorn instructed that no trees should be cut down for the construction of the resort, and three decades later the buildings are still in harmony with their tropical surroundings. 83 luxurious suites, cottages and villas sit amongst the trees on the hillside at The Tongsai Bay, each with a private terrace and sea views. The resort features three restaurants, a spa, a gym, two swimming pools, non-motorised water sports, a tennis court, a games room and very good Wi-Fi. Our villa was cleaned each day, and I learnt that the hotel uses natural cleaning products which are produced in their organic garden. This is part of The Tongsai Bay’s green policy, for which they have won many awards. Our stay at The Tongsai Bay was arranged by luxury travel operator Kuoni. We actually booked our honeymoon (to Mauritius) with Kuoni and were very impressed with them, but hadn’t travelled with them since having kids, as we’ve tended to travel independently since then. However, it was brilliant having support and advice from our local Kuoni travel agent while planning our trip to Thailand (especially as it was our first time there), and also from their helpful local representative, Pawn, once we arrived in Koh Samui. It was good to be able to contact Pawn via WhatsApp to ask for her tips and advice about the island, and she also arranged our transfer to Koh Samui airport at the end of our stay. The Tongsai Bay is an incredibly relaxing and peaceful place, but there are also plenty of things to do there. You could spend all of your time at the swimming pools or sandy beach sunbathing and reading (guests have free access to an app which offers thousands of newspapers and magazines to download). There are staff waiting at the beach and pools to set up your sun lounger in sun or shade, as you desire, with fresh towels and a glass of chilled water. If you’d like something to drink other than water, just raise the little red flag on the table next to you and somebody will come to take your order. Or you could have a more active time at the beach by trying out some of the free water sports on offer. 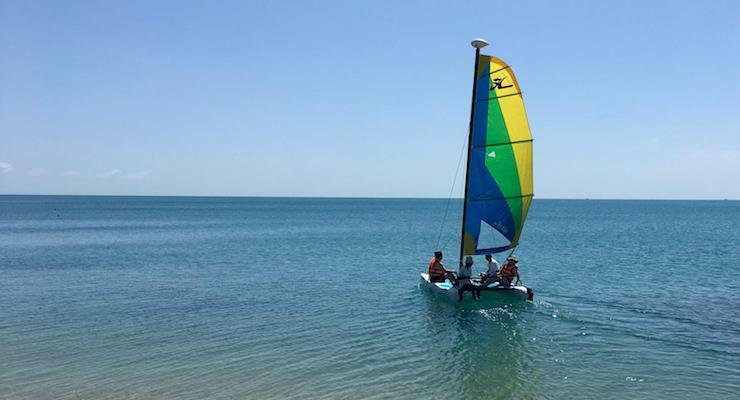 We enjoyed kayaking and sailing, although when I tried snorkelling the water wasn’t clear enough to see very far. I loved swimming in the 60-metre long main pool, and there’s also a quiet pool slightly away from the beach where under-15s aren’t allowed. 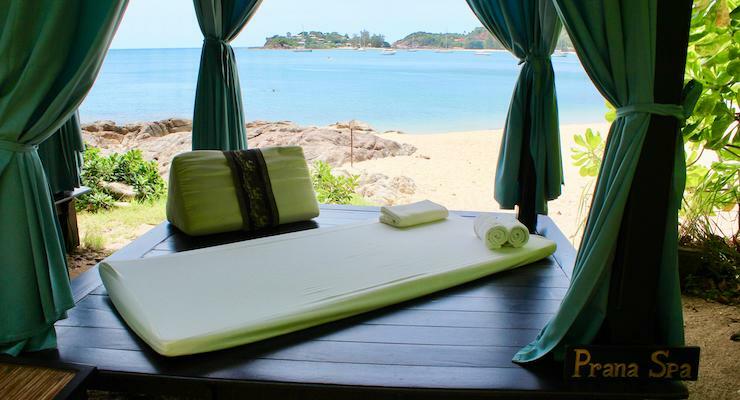 I had a marvellous facial at the hotel’s Prana Spa, as well as a traditional Thai massage in one of the beachside huts. 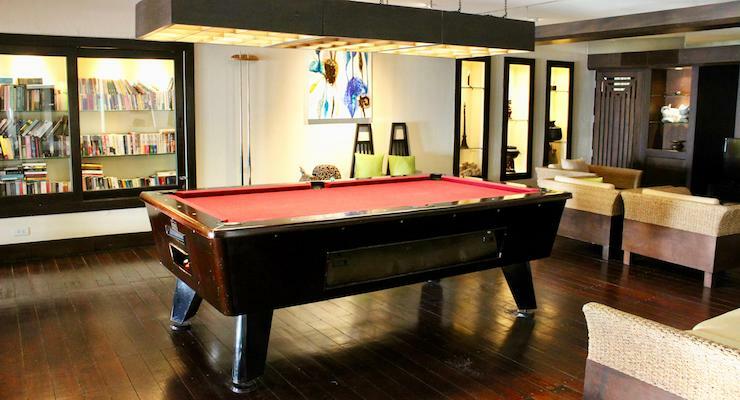 We enjoyed playing family games of pool in the air-conditioned Ga-La room next to the lobby in the evenings after dinner. This is a large room with shelves of books for guests to borrow and comfortable sofas to relax on, and we generally had it to ourselves. There’s also a cosy games room with an Xbox console near the beach, but we didn’t spend any time in there. There’s a weekly programme of events and activities at the hotel, some free of charge and some for a fee. My husband and I enjoyed the basic Thai language and cultural class with teacher Eiuw, and it was good to be able to say a few words in the local language when we hired a car to explore the island the following day. All four of us took part in a fantastic Thai cooking class at the hotel, and prepared a five course meal (both meat and meat-free versions). You can read more in my post Things to do at The Tongsai Bay, Thailand. There are three restaurants at the hotel: Chef Chom’s Thai Restaurant, next to the lobby, Po-Lad Beach Bistro & Bar, and Butler’s. The food is delicious, fresh and healthy and our dietary needs were well-catered for. 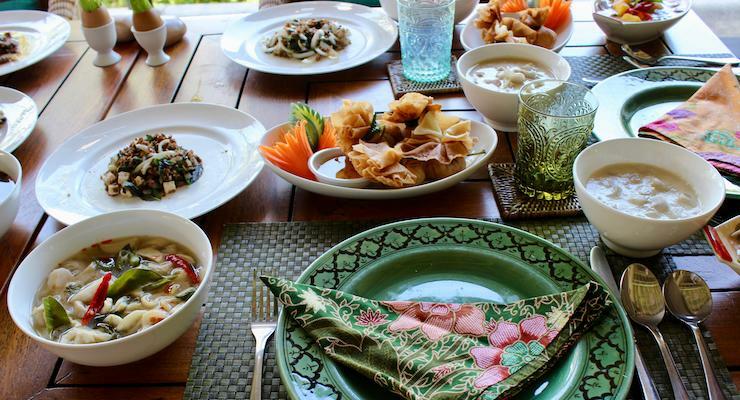 Breakfast is served at Chef Chom’s, and the variety and quality of the food on offer is excellent. Options include, stir fry rice with vegetables, Thai soup, dim sum, sausages, bacon, eggs cooked to order, pancakes, pastries and fresh fruit. There’s a juice bar with a friendly lady making fresh fruit smoothies to order. Hot drinks are served at your table, and there’s soya milk available if you ask for it. 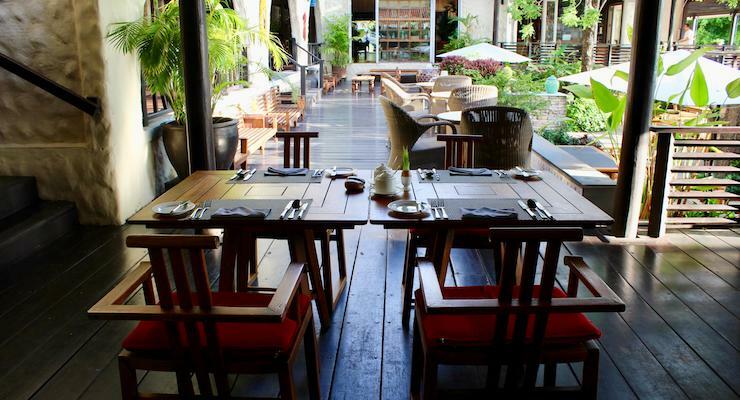 Chef Chom’s has a tropical feel – the tables and chairs are made of wood and rattan with marble table tops, there are wooden floors and the room is open to the leafy garden. You may spot the long, carved gecko up high on one of the walls – this is actually a ‘gecko house’ where the lizards can shelter. Walking up to breakfast one morning we surprised a large monitor lizard on the path – he moved into the foliage as we approached. 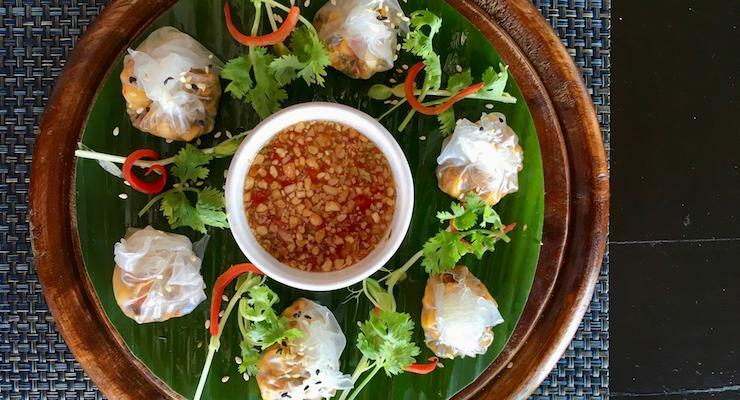 We had a delicious dinner at Chef Chom’s on our first evening. My daughter and I shared vegan red and green Thai curries, while my husband chose stir fry and our son opted for his favourite, Thai duck curry. It was amazing – definitely the best food of our trip to date. We had dinner a few times and lunch on our last day at Po-Lad Beach Bistro. The vegetarian and vegan dishes here were truly delicious. My favourite was the mushroom dumplings with chilli dipping sauce which I had for lunch there, and my daughter loved the meat-free spaghetti bolognese so much that she ordered it three times during our stay. 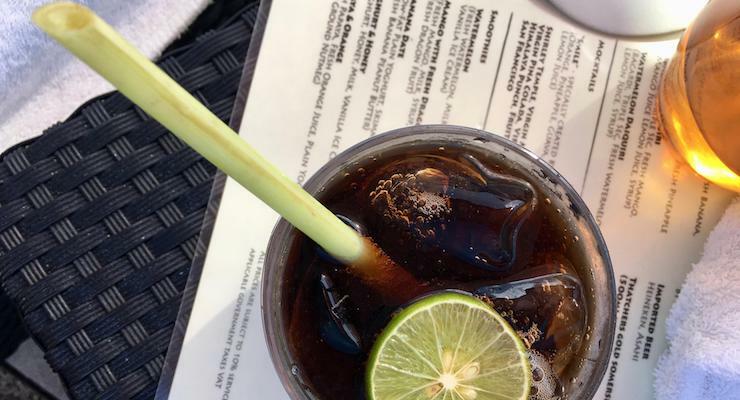 We also went to Po-Lad most evenings for pre-dinner Happy Hour cocktails (or mocktails) at sunset, and I was delighted to learn that lemongrass is used instead of plastic straws for drinks! We didn’t manage to eat at Butler’s, as it was only open a couple of times during our stay. Although we could have easily spent our whole stay at The Tongsai Bay, we did venture out to explore the island a couple of times. One evening we took a taxi to Chaweng, a lively resort 20 minutes away. The town seems to be mainly bars, places to eat and souvenir shops, and it’s pretty hectic – I wouldn’t go back there. Another day we hired a car and drove around the island to see the main sites. Having been cocooned in the peace of the resort for a few days, I was surprised by how built up much of the coast is. We went to see beautiful Crystal bay beach, the Nan Muang Waterfalls, the Big Buddha and Bophut Fisherman’s Village Night Market. My favourite place was Fisherman’s Village, and my daughter and I bought a few gifts at the market. I absolutely loved everything about The Tongsai Bay and would definitely recommend it. The rooms are beautiful and have everything that you need for a relaxing stay. The staff are friendly and caring. Its green policy and ethical approach to the environment make it really stand out. You can book a holiday at The Tongsai Bay with Kuoni. At the time of writing they’re offering packages from £1,399 per person for seven nights, including flights, transfers, room and breakfast – but obviously the price varies according to the season. Or you can book independently with The Tongsai Bay and make your own travel arrangements. We travelled to Koh Samui by ferry from the mainland, then flew from there to Bangkok with Bangkok Airways and from Bangkok to London with British Airways. If you want to travel independently you can book flights with Skyscanner. *Disclosure: This post contains some affiliate links, which means that if you clicked through and booked I may receive a small commission. 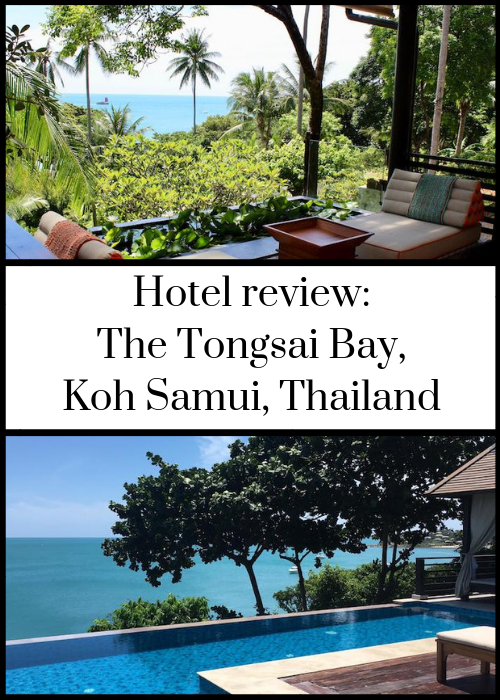 We were hosted by The Tongsai Bay and Kuoni for five nights on a B&B basis for review purposes. We paid for our own flights, meals (apart from breakfast), excursions and other expenses, and for two nights at The Tongsai Bay. All opinions, words, images and video are my own and are completely independent, as ever. This looks amazing! My mouth was watering looking at all the nice foods. Great that the watersports are included in the price too. Yes, it’s a great place to stay. Wow Thailand looks really awesome and makes for a great beach vacation. 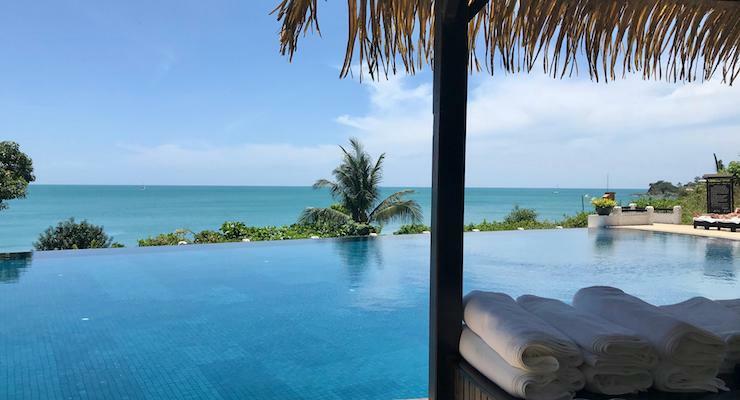 I am so glad you had such a wonderful time – Tongsai Bay looks utterly idyllic, and I really do think some of the best hotels I’ve ever stayed in have been in Thailand. Thanks Ting – it really is a fantastic place to stay. That’s great to hear – it must be a wonderful place for a wedding!